Above the final slab pitch of K2, the 5.8 route that ascends Corcovado, we coiled our ropes, swapped rock shoes for flip flops, and headed up the thick jungle brush, abandoning our sub-optimal topo for the comfort of a trail. We wondered how close we were to the top, the only beta photo we’d found showing a woman in a swami belt and old EBs, still on belay as she mounted the railing of the viewing area. Come to think of it, it might have been in black and white. But then, out of the treetops came the familiar sounds of monkey calls and wolf howls, and we answered them ecstatically. 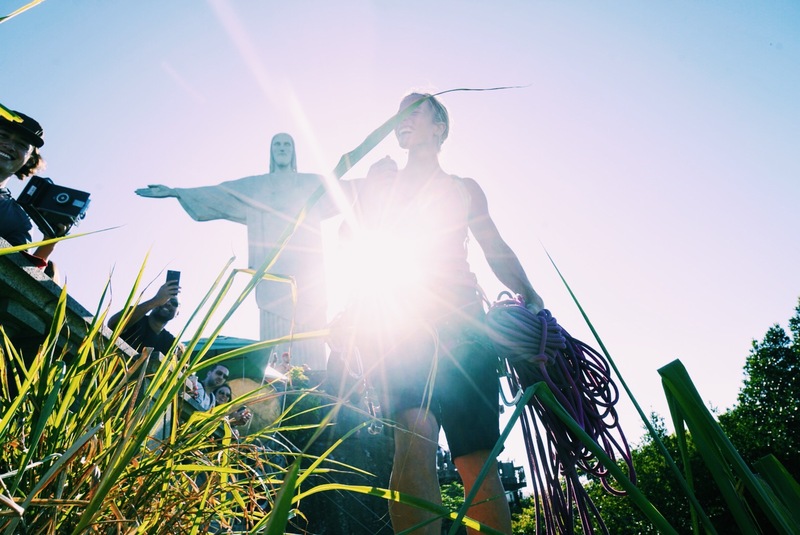 Emerging from the forest into tall grass, we looked up to see the arms of Christ the Redeemer, open and inviting as always, right alongside those of our friends, holding water and popsicles and celebrating our arrival. It was by far my most bizarre and fun summit arrival to date, and a really cool climb at that. Check out that summit welcome! Getting to the start of the approach can be tricky. Cabs will likely want take you to the base of the tram, where you’ll find tons of tourists and a host of small tour buses offering trips up the hill. If you pay for a tour bus, it will be more expensive and a more round-about drive, and they might try to take you all the way to the top. The best route is to convince a taxi driver to take you to the mid-station of the tram at Hotel Paineiras, at a point where all traffic is stopped and only buses can continue. If you end up taking a small bus, make sure you get off here. Alternatively, you can take the tram from the bottom and get off at the Hotel Paineiras Station. Once at the tram station, walk the road up the hill alongside the tour buses, going under the tram tracks and continuing for a little less than a mile. When the road takes a sharp hairpin turn to the right, look for a climbers trail on the left, and follow this all the way to its end. You are now at the base of K2, say hello to the lizards! Continue up through the forest for a few minutes, following an obvious trail, before you pop out of the trees and tall grass to the open arms of Jesus Christ the Redeemer (and hoards of applauding tourists!). You can try to jump on a bus, but we were asked to pay, and opted to take the tram down. Perhaps if you paid for a bus ride up you could at this point make good on your round trip ticket. Contrary to Sugarloaf, you can buy downloading tickets on the tram from the summit of Corcovado. This will take you all the way to its base in the Cosme Velho neighborhood.